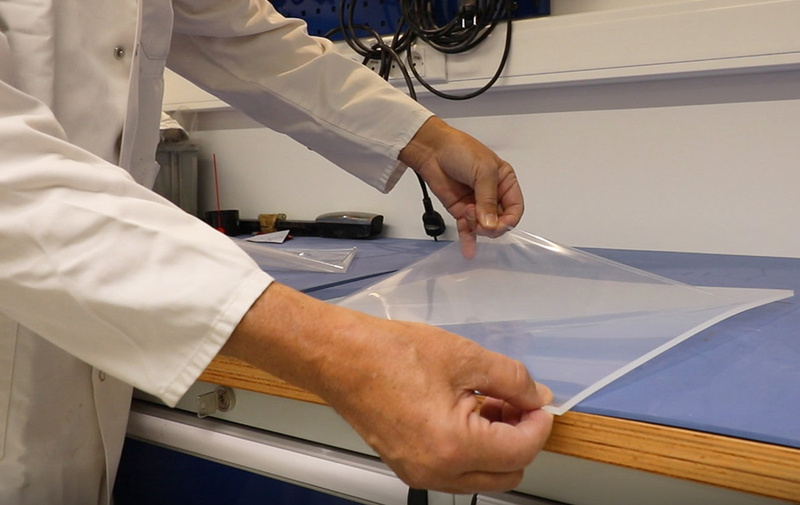 The soft and supple Orfitrans thermoplastic sheets are ideal for the fabrication of flexible prosthetic sockets and can be used as a comfortable lining material. 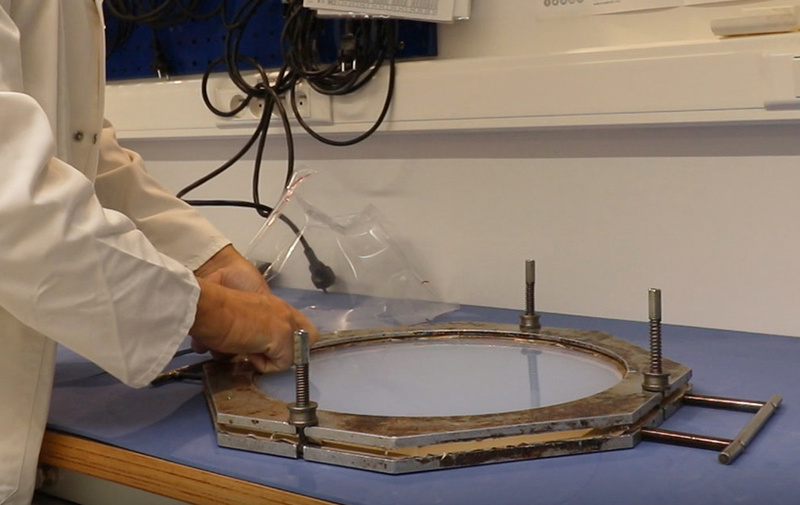 In this guide, we explain how to expertly mould our flexible thermoplastic sheets for smooth and soft sockets. We show how to prepare the sheet, optimize your positive mould and share some general moulding tips. Follow the steps and pull the perfect sockets time and time again. 1. Pre-heat your oven to the correct temperature. All Orfitrans products require different heating temperatures and heating times. Check the heating instructions for each Orfitrans sheet. Scratch four air extraction ducts in the base of the positive mould with a cutter. These help the air to escape later when activating the vacuum. Spray the positive mould with acrylic varnish and let it dry. 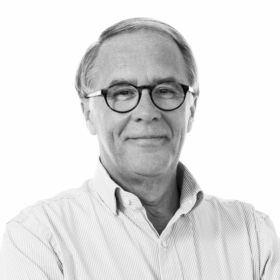 Read our five tips for the perfect positive mould for more information. Remove the protective film on both sides of the sheet. As an optional step, you can cut the sheet to the shape of the supporting frame. The excessive material could otherwise get in the way during the moulding process. Wedge your thermoplastic sheet firmly into the supporting frame. Place the sheet in the oven and set the timer. Pull a piece of stockinette over the base of the positive mould to aid in the removal of the socket later. Just make sure it does not cover the actual socket area, this will result in a rough inner surface. Position the positive mould on the vacuum pump. You can lightly spray the mould with a silicone de-moulding spray to aid in the socket removal afterwards. Note: silicone de-moulding spray can be used for all Orfitrans sheets, except Orfitrans Excel. Look at the long and short edges of your positive mould and picture how you will be placing the bubble. Make sure you have enough material to cover the long side of the mould. Place the sheet in the oven and set the timer to the recommended activation time. Do not leave the sheet unattended in the oven. If flexible socket materials stay in the oven for too long, they could drop excessively and melt onto the bottom of your oven. Once the bubble has dropped sufficiently, take it out of the oven. Position the bubble slightly off-centre over the positive mould and let the material form against the mould. Support the frame and offer some resistance, to avoid that the sheet drops too quickly. 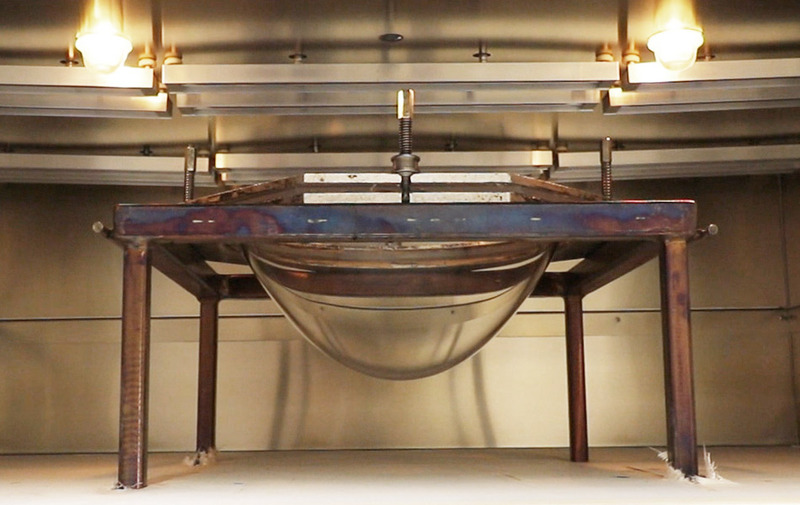 Activate the vacuum slowly in order to let the material conform to the positive mould. Check whether the material is conforming evenly. If necessary, press the material lightly against the plaster to smooth out any gaps. Allow the material to set on the positive mould until completely cool. 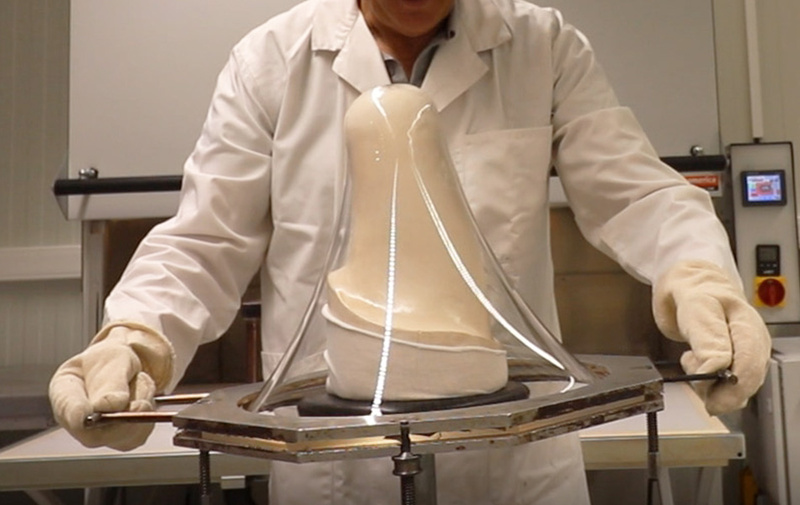 A PE-copolymer for orthotics and flexible prosthetic sockets Orfitrans Excel is lighter in weight than most other materials, resulting in increased patient comfort. 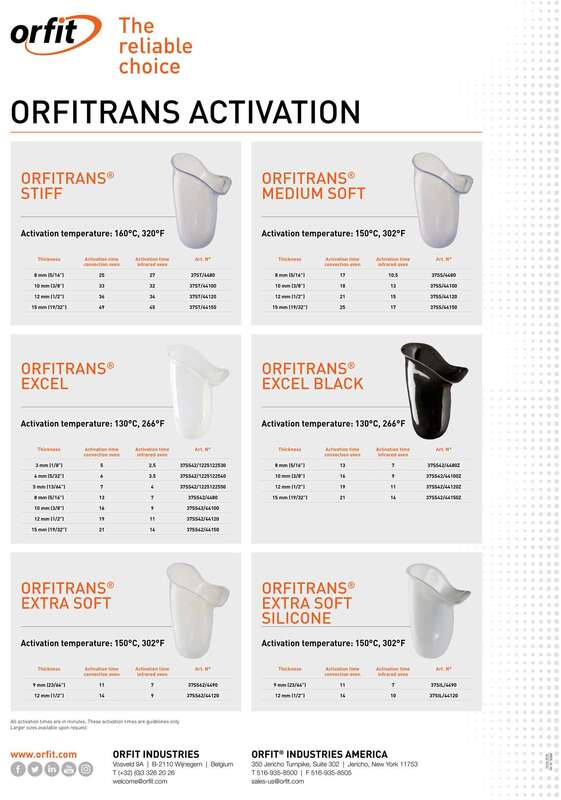 Highly flexible prosthetic sockets Orfitrans Extra Soft is the perfect flexible material with outstanding patient comfort. Highly flexible with very smooth touch for prosthetic sockets Orfitrans Extra Soft with silicone is a flexible material that feels great and is not tacky or sticky. The field of prosthetics has a long and rich history, dating back to the 5th Egyptian Dynasty (2750 - 2625 B.C.). The oldest practical prosthesis known to man is a toe made of wood and leather, which archaeologists found attached to the 3000-year old remains of an Egyptian noblewoman.